United States president Donald Trump on Tuesday announced a plan to end preferential trade treatment for India, withdrawing benefits under a nearly 50-year-old programme for up to $5.6 billion worth of New Delhi’s exports to America. The move comes after over a year of back-and-forth between the two countries, and pressure exerted upon the Trump administration by the American dairy export and medical devices lobbies. 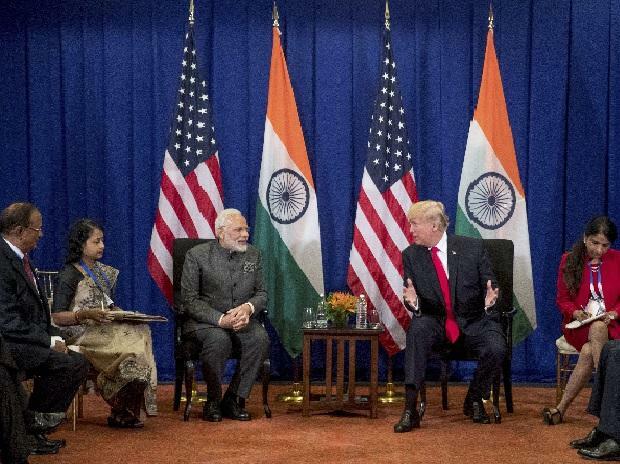 “I am taking this step because, after intensive engagement between the United States and the government of India, I have determined that India has not assured the United States that it will provide equitable and reasonable access to the markets of India,” Trump said in a letter to Congress representatives on Tuesday early morning. According to World Bank data, India is currently the largest beneficiary of the ‘generalised system of preferences’ (GSP) programme, a trade initiative that was first started back in the 1970s. India’s commerce ministry, however, has downplayed the impact of the move, saying that withdrawal of GSP benefits will have a “minimal and moderate impact”. “The total GSP benefits amount to about $190 million on overall exports of $5.6 billion between the two countries,” commerce secretary Anup Wadhawan said at a press conference on Tuesday morning. How did US-India economic tensions reach this point? How symbolic is this move? The Wire breaks it down. Why did Trump take this step? The Trump administration has a number of grievances against India on the trade front. These range from the president’s personal pet peeve (high tariffs on imported Harley-Davidson motorcycles) to other trade barriers on goods like natural rubber, textiles and alcoholic beverages. The decision to review and ultimately eject India from the GSP programme, however, was sparked by representations made by two American lobbies – the medical devices industry and the two dairy products associations. Companies in these sectors felt that India had erected trade barriers for their goods and products. As a measure of retaliation, they wanted Trump to withdraw India’s GSP benefits. In October 2017, the Advanced Medical Technology Association (AdvaMed) – which represents top-tier firms like Abbott and Medtronic – made representations to the US Trade representatives in this regard. Their move was prompted by decisions taken by India’s drug pricing regulator to significantly cut the prices of cardiovascular stents and knee implants. As The Wire has previously reported, the American milk and cow lobby is also upset with India over a decade old religion-based rule that requires all imported dairy products to be derived from animals that have never consumed anything containing “internal organs, blood meal or tissues of ruminant origin”. India was not willing to bow down to both these demands. In his press conference, Wadhawan indicated that both requests were non-negotiable. Will it hurt India economically? The commerce ministry has shrugged off concerns that it will have any major economic impact, noting that total benefits amount to roughly $190 million on overall exports of $5.6 billion. In a statement, Ajay Sahai, the Director General of Federation of Indian Export Organisations, has noted that farm, marine and handicraft products were also likely to be impacted. As the table below shows, the top GSP products that were exported by India to the US included ‘intermediate goods’ – a term that refers to products that are low on the manufacturing value chain and thus not made competitively in the United States. Indeed, this is the crux of the matter: the actual duty benefits of the GSP programme is small in the larger scheme of Indian trade. However, they disproportionately affect India’s small and medium businesses. In the run-up to India’s GSP review, over 50 MSMEs submitted comments and pleas to the US government sub-committee in charge of the decision. As The Wire reported at the time, these small firms, makers of everything of auto parts to terry cloth, made it clear that if GSP benefits were to be withdrawn, China would eventually benefit. “Please be noted that there are no Industries in the US for packing 25Kg & 50Kg bags which fall under 3923 and therefore the US is benefitted by Importing the same from countries like India. This kind of angst is something the Modi government can’t afford in months leading up to the Lok Sabha elections. India’s MSME sector has already had a tough run in the last three years, dealing as it had to with demonetisation and poor GST implementation. While the Trump administration’s decision will not take effect for at least 60 days, which gives New Delhi some elbow room, it will no doubt have a ripple effect on what has traditionally been a voter base for the BJP. External affairs ministry sources have indicated that India will still “continue to talk” to the United States government. “Our view is that we are still in discussion, and we will continue to talk to them. We would like to see that we could reach an agreement,” MEA sources said. It is unclear however whether a compromise can be struck in the next 60 days. How symbolic is Trump’s move and what does it mean for future trade talks? The decision to withdraw GSP benefits comes at an uncomfortable time for India. Washington and New Delhi are already at loggerheads on a range of other trade tariff issues. For instance, the Modi government has been uncertain on whether it wants to draw a line in the sand on retaliatory tariffs. In 2018, the Trump administration refused to exempt India from its new steel and aluminium tariffs. In response, the Centre decided to raise import tax from August 2018 on some US products including almonds, walnuts and apples. However, India has refused to take the plunge and actually do it: it has delayed implementation of higher tariffs a number of times. The last time it deferred acting on its retaliatory action was just two weeks ago, in the last week of February 2019. On other trade battlefronts, India is on a firmer footing but hasn’t found a way to make the US accede to its demands – particularly on lower customs duties on smartphones and contentious e-commerce issues. The GSP blow, while largely symbolic, shows that like many other countries, Trump is unwilling to settle with India until the bilateral trade deficit ($20 billion or so) is decisively chopped.